Amanda Broadway. Photo by: Mick Leonardi. Review by Jacob Ryan (@GonzoWithGusto). Photos by Mick Leonardi. 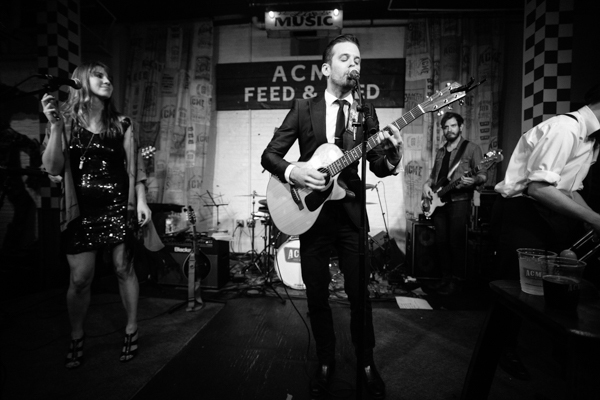 If you book them, they will come … to Acme Feed & Seed every Tuesday, for a weekly showcase from No Country Presents! 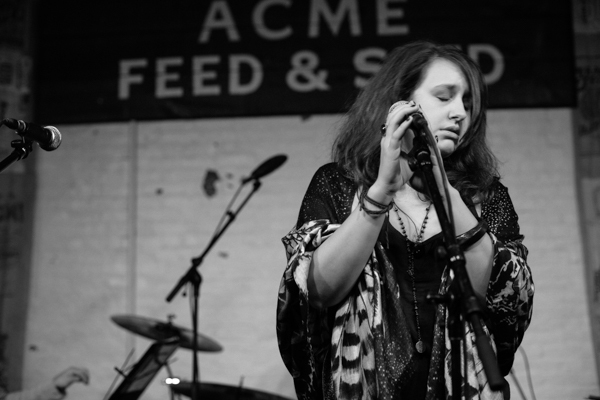 Our latest installment featured soul moma Amanda Broadway (and her big bad band), indie folkstress Whoa Dakota, and Americana crooner Dustin Sellers. Read on for a recap, and for some great shoots from resident musician and contributing photographer Mick Leonardi. Also, don’t miss the next installment, on Tuesday, March 31, featuring Matt Walberg & The Living Situation, Heathen Sons, and Marcella Simien. The typical Tuesday double: toiling away behind a bar by day, chasing my dreams of rock ’n’ roll journalism stardom by night. Beats a 9-5… to me anyway. By some stroke of pure, dumb luck, I snagged a open spot, not for musician loading only, on Broadway, and made my way to Acme Feed & Seed just in time for the start of Dustin Sellers’ set. Dustin Sellers. Photo by Mick Leonardi. Dustin’s face is one we remember from various other bands like Magnolia Sons and Overzealous. However, on this occasion he was highlighting his own, personal work; a fresh, alt country meets big band presentation which highlighted his pure, Americana songwriting. Mixing in mandolin, keys, and even some brass, I liked what he was cooking. A newer song, entitled “Like a Book,” caught my attention as did a more rock ready, older number called “Big City Post Cards.” Everything he played had polish and style, much like his dressed to the T band. Most of all, Mr. Sellers has the the feel of an artist who has ‘it’ and could blow up at any moment. Get more of the Tennessee native in your life immediately. Whoa Dakota. Photo by Mick Leonardi. Next up was indie, blues rock poet Whoa Dakota, whom we’ve written about before (read this post). 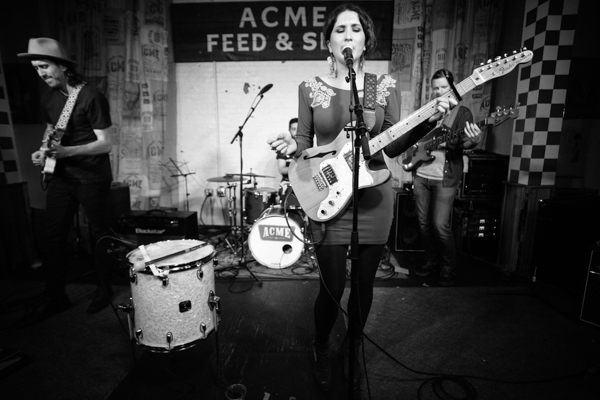 It was the first time she’d played with this lineup, and it’s her third band incarnation. As many of you know, shuffling band lineups are pretty much the norm in Music City, but the songs were all hers. Her pretty singing complemented the heavy blues guitar grooves. Her music is a milder version of the Yeah, Yeah, Yeahs mixed with some newer Black Keys ambiance. Some of my favorites were “Mess Things Up,” and “So Much Trouble,” and when she let the boys in the band take a breather, and she went at it solo, there were chills aplenty. Amanda Broadway. Photo by Mick Leonardi. After a beer and a smoke, it was time for Acme house band (The Music City Toppers) singer Amanda Broadway to do her thing. 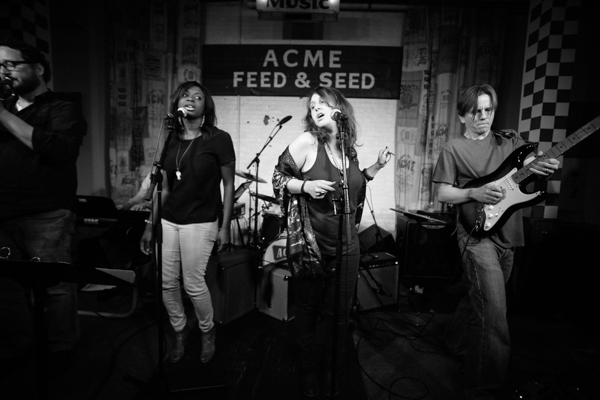 The Toppers and Amanda play a weekly funk show Thursday at Acme called the Funky Tonk, which you need to check out ASAP. On this night it was a little less funky, and more smokey soul, as her amazing voice was on full display. The massive nine member band, brass section included, were no slouches either. They blasted though her blues tinged jam fest of a set, with dual guitars blazing. Amanda has an Aretha Franklin bigness to her voice, strange from a fairly small framed person, but a strut all her own. During the set, several of the touristy looking crowd started spontaneously dancing with their dates or other minglers in the bar. She was also sure to let each member of her band have their time to shine; chill, muted trumpet solos, into extra crunchy guitar riffs, a wonderful blend of many of my favorite genres. Towards the end. they did a badass Ike and Tina Turner joint and then closed it out with a classic, “Voodoo Woman” by Koko Taylor. Mighty fine indeed, and we’re doing it all again next Tuesday, so be there!